Join the Conservatory's pre-college Youth Symphony for a concert featuring music by Hérold, Rossini and Mendelssohn. To celebrate the Veteran's Day and the 100th anniversary of the end of WWI, the orchestra will perform some of the well know military marches. The concert will also feature guest choirs from Tracy high schools: Tracy High School Madrigals, West High School Advanced Choir, and Kimball High School Choir. 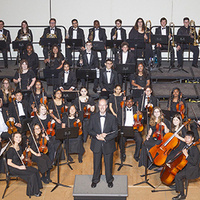 Now under the leadership of the University of the Pacific Conservatory of Music, the Central Valley Youth Symphony has provided young people ages 8-22 in San Joaquin and surrounding counties with the opportunity to play great symphonic music since 1965. Weekly rehearsals prepare student musicians for 3 - 4 concerts each year in Stockton, Tracy, and Lodi. The Youth Symphony features two orchestras where students receive expert coaching from Music Director Thomas Derthick and Preparatory Orchestra Conductor Shane Kalbach. Faculty and students from Pacific Conservatory of Music also assist throughout the season.